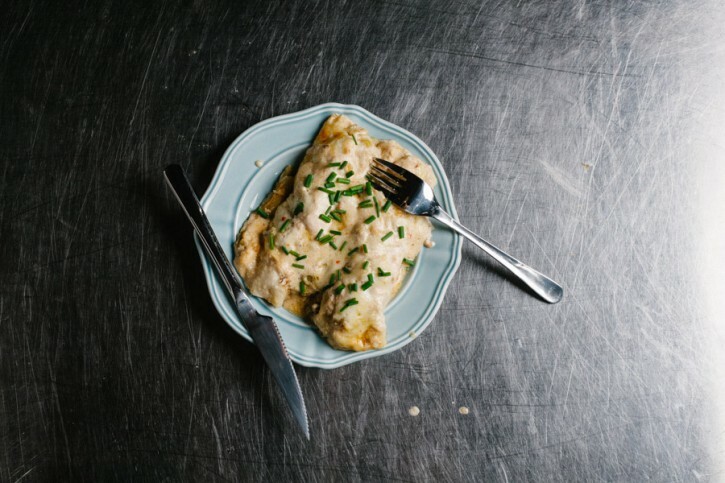 Creamy, cheesy, green chili goodness. Forget about going out for enchiladas. You can do better at home! 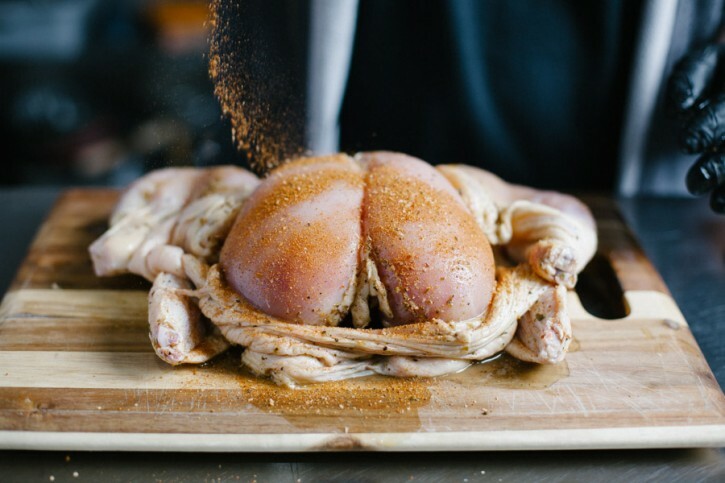 I love cooking whole birds. It gives you a great variety of flavors and textures from the different cuts of meat. 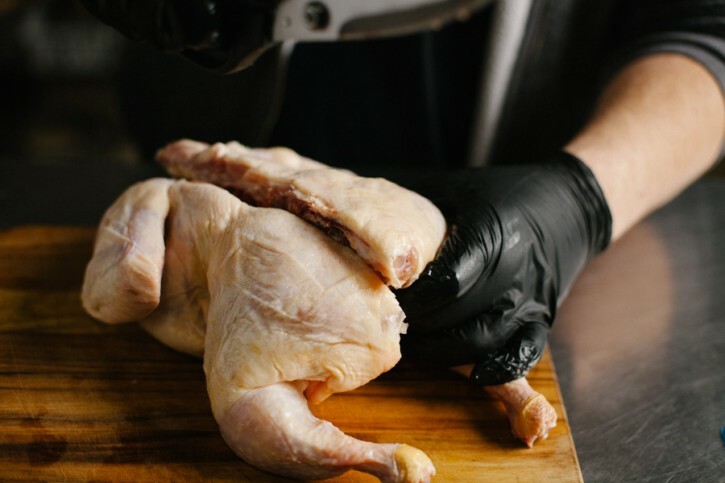 If you’re not yet familiar with the spatchcock technique, be sure to check out our video on how to do that. 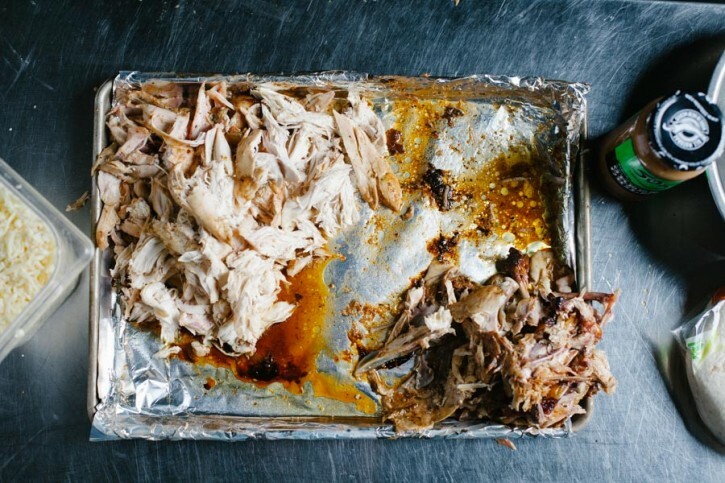 Meat pulled from bones (which you can discard). Don’t forget to toss the shredded chicken in the juices in the pan. It was soak all of that up. You really don’t want to skip this step! 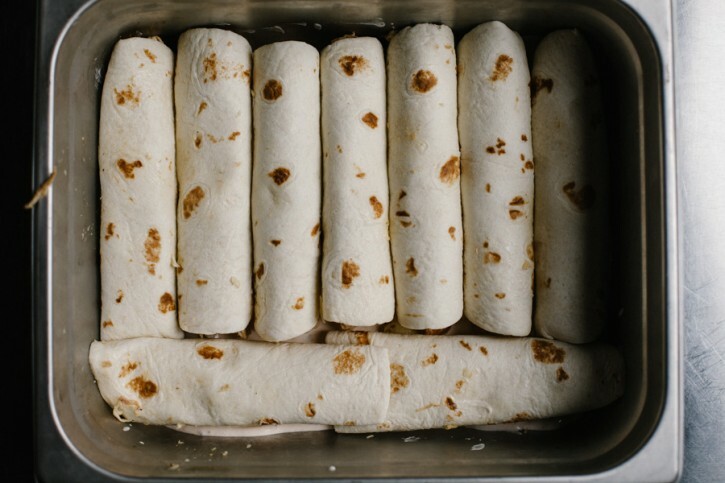 Stuff those tortillas nice and full! 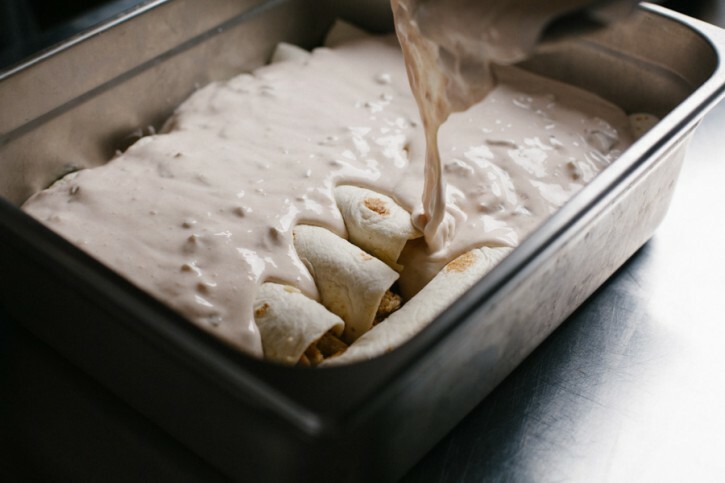 Our green chile sauce and sour cream mixture will make a beautiful creamy sauce that we’ll use to smother the enchiladas. Cut the backbone out of the chicken in order to cook the bird spatchcock style. Loosen the skin from the flesh, but keep it attached. Place in a zip top bag with equal parts Sweetwater Spice Lime Jalapeño Fajita Bath and water. Refrigerate for at least 2 hours, up to 5 hours. Preheat your Yoder Smokers YS640 Pellet Smoker to 325ºF, set up for indirect grilling. 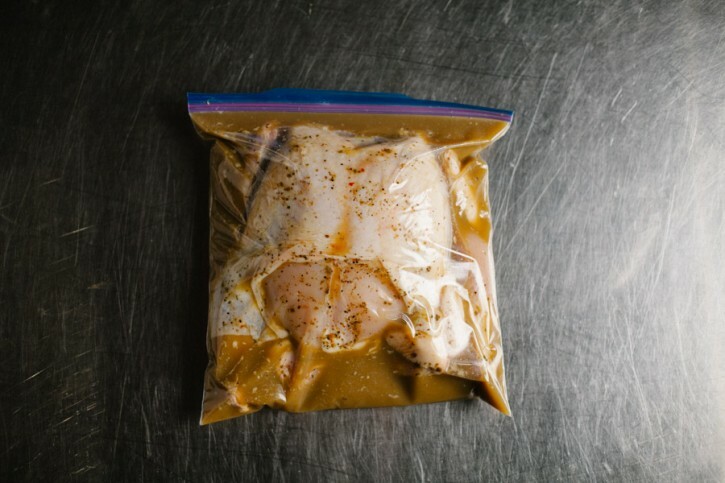 Remove the chicken from the liquid. Pat dry with paper towels. Season the meat under the skin with both Cattleman’s Grill 8 Second Ride Carne Asada Seasoning and Dizzy Pig Fajita-ish. 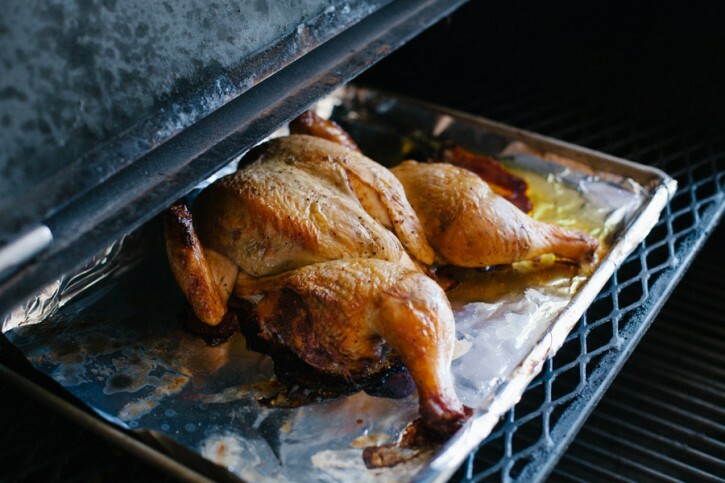 Lay the bird flat on a foil lined sheet pan, cavity side down. Cook on the second shelf until the internal temperature of the breasts reaches 160ºF. Remove from the cooker. Turn the cooker up to 425ºF. When the meat is cool enough to handle, separate the meat from the bones. Discard the skin and bones. 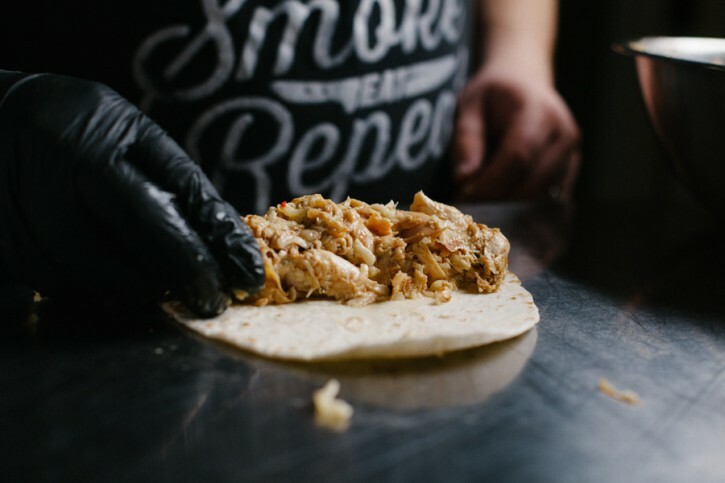 Shred meat by hand. 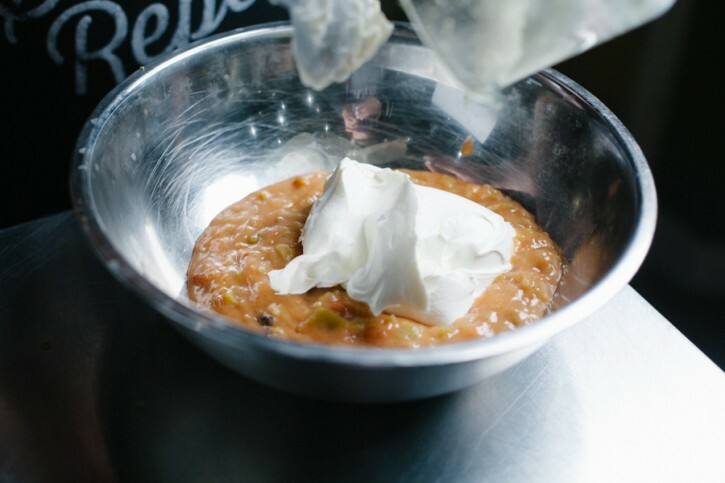 Combine the 505 Medium Green Chile Sauce, sour cream and vegetable stock. Mix well. Spread a thin layer of the sauce in the bottom of a 9”X13” pan. Combine the shredded meat (you should have about 5 cups) with 3 cups of pepper jack cheese. Mix to incorporate. Place about 1/2 cup of the mixture on a small tortilla, and roll up. Place seam side down on the sauce in the pan. Continue until the pan is filled. Pour the remaining sauce over the top of the enchiladas. Then top with the remaining 1 cup of pepper jack cheese. 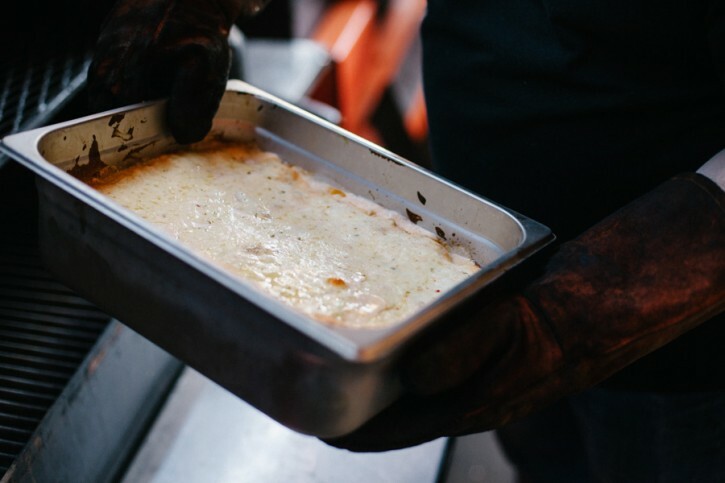 Bake at 425ºF on the second shelf until the cheese is well melted and the sauce is bubbling all over, about 30-40 minutes. Remove and serve hot.